Elephants never forget – or do they? 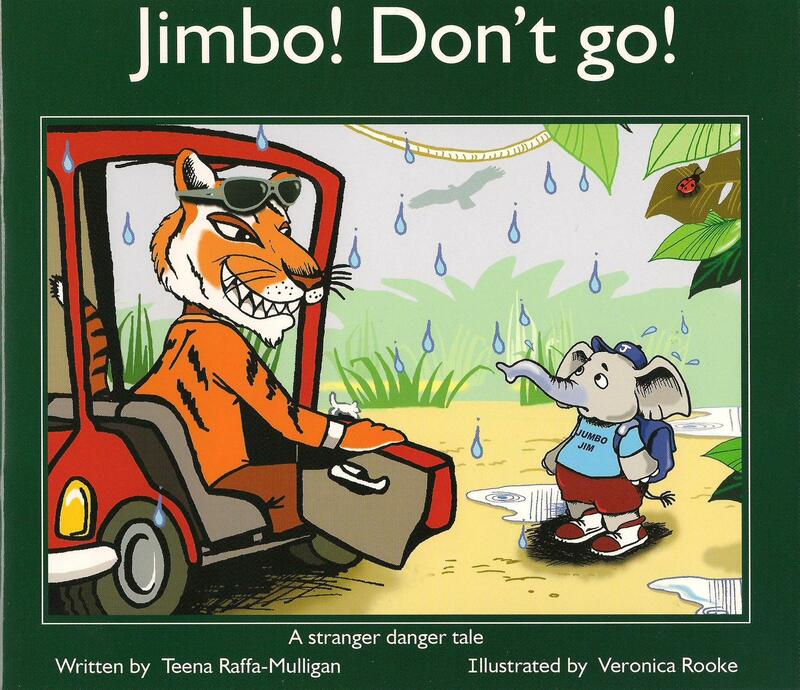 One rainy day Jumbo Jim is on his way home from school alone when a tiger stops and offers him a lift. Tim promises to get him home and dry quicker than a snake can blink an eye – but Jimbo says no. Mum has told him never to go with strangers. That’s when Tiger Tim says he is a family friend – and he has chocolate, too. Will Jimbo remember his mother’s stranger danger warnings – or go with Tim? Jimbo! Don’t Go! is a 16-page full-colour paperback picture book with glossy wipe-clean cover and interior. Told in rollicking rhyme, it presents the stranger danger message for pre-schoolers and junior primary children in an entertaining, non-threatening style. Format: Landscape, full colour picture book printed on glossy wipe-clean stock. Teena Raffa-Mulligan looks like a responsible adult. Don’t be fooled—it’s a disguise. The real Teena is a kid who gets a kick out of playing with words and having adventures on the page. Her publications for children include poems, short stories, picture books, chapter books and middle grade novels. Teena has also worked as a journalist and editor. She loves sharing her passion for books and writing with people of all ages and encouraging them to write their own stories.